Options floor there is a hugequantity. Each of them has its advantages, but it can not do without drawbacks. 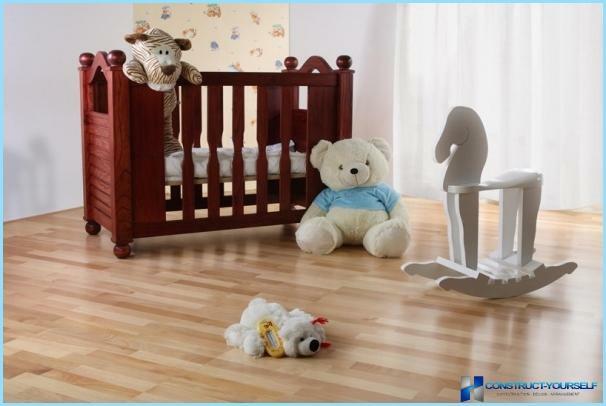 The choice of flooring in the nursery is especially important. However, due to the abundance of options, choose the appropriate, can be quite problematic. Children's room is more functional than itit may seem at first glance. After all, a child is its own little world, which belongs only to him. In addition to recreation, the room serves as a play and learning area. Also, the child can take her guests and friends for various games. That is why it is important that not only the furniture and furnishings, and floor met all the requirements. Heat. The kid will be spending a lot of time on the floor for the different games. To him it was comfortable and cozy, you should not obscure the floor materials that do not retain heat in the room. Ease of cleaning. While playing, the child may overturn, spilling something. Therefore, it is important that the floor is easy to give in both wet and dry cleaning. Originality. Children as well as adults, beauty is important. 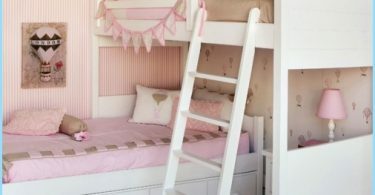 However, if parents prefer a more soothing colors, the children will always be interesting to be in the room, which is paved with flooring with intricate, colorful and original patterns or pictures. The practicality and cleanliness. Daily flooring will resist the stresses of varying degrees. Therefore desirable to take low-quality coating, which may soon give a crack, scuff or even in any way lose the original appearance. 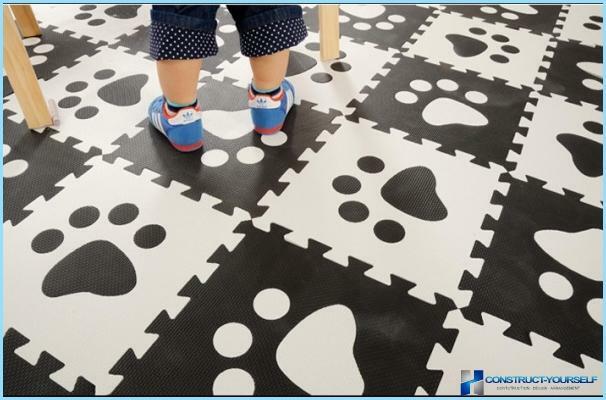 But it is equally important to the floor at the same time was made only from environmentally friendly materials, because the child is much more susceptible to a variety of toxins than adults. In addition, it is desirable that the floor was antistatic and resist ignition. 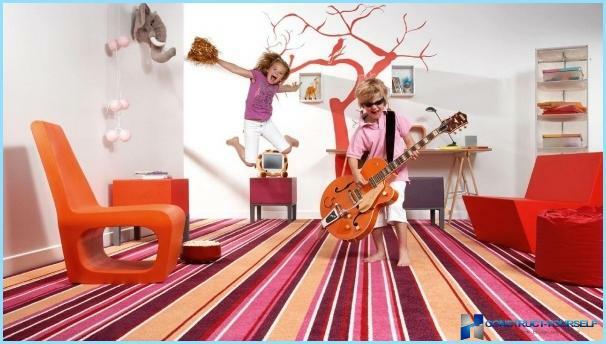 The most popular flooring materialsfor children's rooms are parquet, linoleum, laminate and cork. But the best option is considered to be the division of the total area into zones. In this case, one coat will be placed in the training side of the room, and in the game - more. 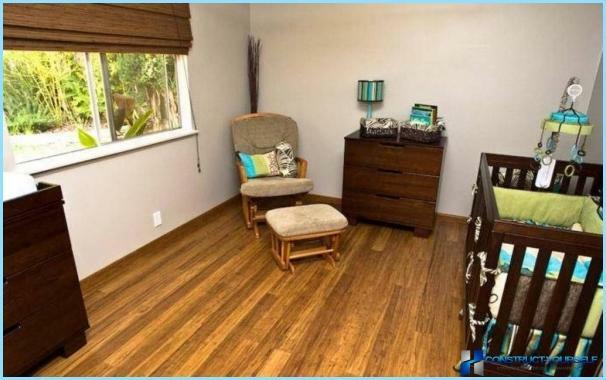 Before you buy a floor covering fora child's room should be guided by the child's age. 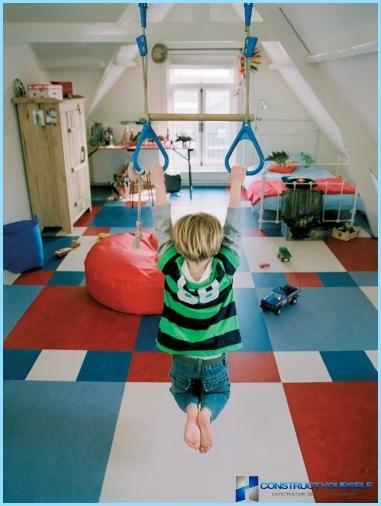 For a kid who just started or will start to take the first steps, it is better to lay a floor rug or carpet. After all, there is no doubt that the child will fall quite often. This coating will soften the fall and protect against possible injury and bruising. However, if increasing the creative person, the futurepainter or sculptor, on the carpet should be abandoned. After wash the paint from it, remove traces of glue or modeling clay to pull out quite difficult. In this case, fit laminate or linoleum, as these materials are easy to clean. In addition, they have a wide choice that will appeal to both the child and parents. 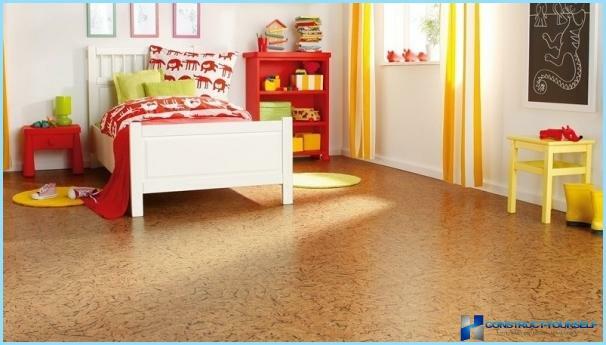 Another important advantage of linoleum is its relatively low price and with good quality. Laminate is the perfect flooring. It is able to withstand the various loads and shocks. In addition, it is easy to clean and wash, which is undoubtedly very important. From a wide range you can choose a colorful model that will decorate the nursery colors and baby will delight. In addition, the coating is best suited for installation beneath underfloor. Important! In the manufacture of the material used various resins which are not entirely safe for health, especially for the developing organism. Avoid negative impacts can be,purchasing only high-quality and expensive laminate (from 500 rubles per square meter). In this case, the percentage of emitted substances minimum and will not affect the future health status. Manufacturers cheaper material save on almost everything and at the same time hide the true toxicity of the laminate. Therefore, the acquisition should be treated with utmost care and to purchase goods only from high-quality and proven brands. Only in this case it can be without any fear putting laminate flooring in the children's room. natural materials, which makes the tube perfectly safe for the health are used for fabrication. These floors are the most retain heat creates an additional sound insulation in the room. Material pleasant enough to the touch. The child would be happy to get out of bed, resting his bare feet on a cork floor. Children's room - it's constant movement. In order not to get hurt, the floor should not be slippery. Cork and corresponds to this important rule. Adults will not be difficult to scrub even serious stains, as the coating does not absorb moisture and does not accumulate. Various options allow you to choose colors for the floor absolutely any interior. Cork has a hypoallergenic properties and does not accumulate static electricity. At this coating can spend a few hours playing various games with your friends. At the same discomfort never remind of itself. Cork flooring is not necessary to obscure the various carpets that like to collect dust. 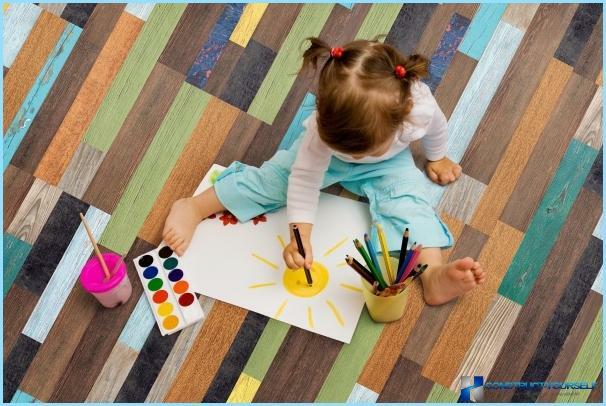 It is because of all the advantages and virtually no disadvantages, cork flooring for the nursery choosing more often than any other coating material. Linoleum - another popular material that can cover the floor. Typically, in an apartment he used for the kitchen or bathroom. 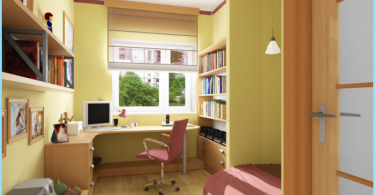 But with the right approach, and it is suitable for a child's room. The main advantage over other materialsis the low price. If desired, you can find coverage with a cost less than 200 rubles per square meter. However, the children's room is better not to try to save. After all, the price depends directly on the quality. The strength and durability. Even relatively low-cost coverage options can last quite a long time, considering the daily load. Ease of installation and maintenance. Lay linoleum is simple. Enough to hold measurements, apply glue to lay. Further care does not require much effort. Cover easily tolerate a dry and wet cleaning. Variety of colors and patterns. Linoleum can be purchased with a variety of ornaments that will surely be of interest to the child. For their study the baby will hold more than one hour. However, the coating can be found and disadvantages. Many models are rather slippery, especially if the floor has been poured liquid. This deficiency is one of the most important, since neither the beauty nor the strength on the need not to catch up with safety. Also common linoleum can not be noted on the positive side in the heat containment plan. But to achieve the desired effect is possible, using extra insulated coating layer. Latest mobile trends on the market floor coveringsmaterial is EVA. 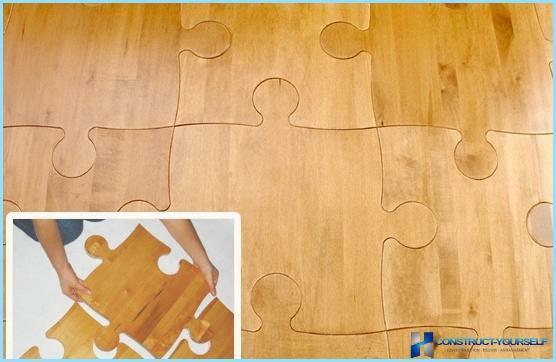 From it are made of original soft floors, puzzles, which are perfect for a child's room. In addition, not necessarily to finish them all the room. That floor mats can be designated gameor any other area. A special feature is that the sale floor Children's Room in the form of puzzle is not only a conventional multi-colored squares. 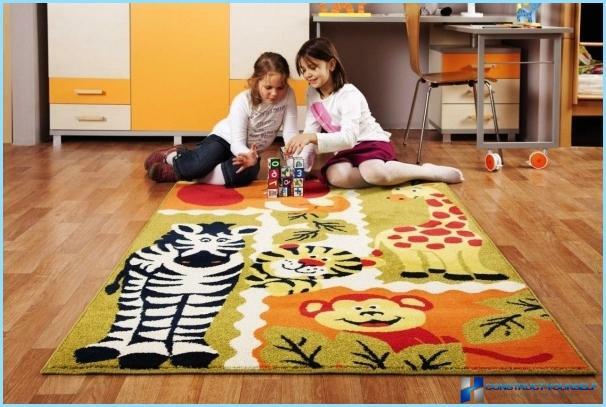 You can install the flooring with different patterns of plants, animals, cars and other things. Thus, EVA puzzles go up for both boys and for girls. At the same time, the baby can develop. Besides the obvious advantages, it is worth noting that only environmentally friendly ingredients are used for the production of the material. Therefore, children's room is completely safe for the baby.